It's another legal win for Nintendo as 11 retailers in the Netherlands have been convicted of illegally importing and selling R4 cards and mod chips for the Nintendo DS and Wii. It's no secret that Nintendo has a "thing" for piracy and isn't shy about bringing the legal guns to bear wherever and whenever it feels the need to do so. 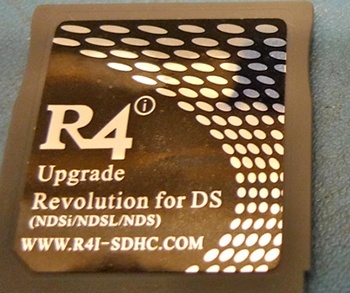 The latest battleground is the Netherlands and it's another check in the "win" column for Nintendo: The Hague District Court convicted 11 retailers of breaking the law by importing and selling R4 chips for the Nintendo DS and mod chips for the Wii. The court rejected an argument by the retailers that Nintendo's opposition to sales of the devices constituted "an act of unfair competition." Nintendo said in a statement that it "welcomed" the decision and that it would continue to "take action to prevent the distribution of pirated software and devices that allow illegally downloaded software to be played." "Nintendo takes this action not only for the company's sake, but in the interests of its partners who spend time and money legitimately developing software for Nintendo videogame consoles and systems, and customers who expect the highest standards and integrity from products bearing the Nintendo name," the company said. Nintendo won a similar legal victory against an R4 seller in Australia in February but continues to struggle against piracy; in April the company blamed a nearly 50 percent sales decline in Europe on the prevalence of R4 chips and the indifference toward piracy among many consumers.